Your generosity will make a huge difference to the children who walk through the doors of St. Louis Children’s Hospital. Your support will ensure that every child has a chance to receive world-class care and benefit from the latest research. You will make a difference to children, whether they need a simple vaccine or a life-saving transplant. Your gift will protect their right to childhood. Help us provide hope to even more patients and their families by becoming a Guardian of Childhood today. Thank you. Please join us by becoming a Guardian of Childhood today. Your gift will protect all children’s right to childhood. Thank you. 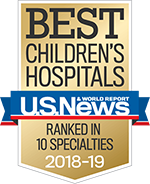 Copyright © 2018, St. Louis Children's Hospital. All rights reserved.